Style Me Bloggers Christmas gift exchange! Some of the Style Me Bloggers had the fun idea of having an Elfster gift exchange. If you are not familiar with Elfster, it’s like Secret Santa. I was assigned a person to buy a gift for and I had someone assigned to buy me a gift. The idea was to buy a gift that represented our region. My gifter was Deena of Shoes to Shiraz. Deena is from Canada! I was so excited to get a gift from another country! 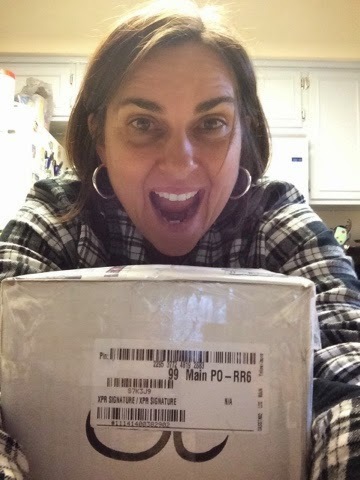 I was out of town when the package arrived so my husband texted me a picture of it. When I got home it was waiting for me! It was pretty heavy and I couldn’t imagine what could be in it. Tore into it and found the coolest stuff! I was so surprised to find *four* containers filled with berry flavored yumminess, a note, and a printout explaining what kind of berries they were. So far I’ve only had the jam. Oh. My!! It is so good! I’ve had it on toast and I’ve swirled a little teaspoonful in my Greek Yogurt. It is sooo good! Next I will try the salad dressing, and durning the twelve days of Christmas (when I have a little time!) 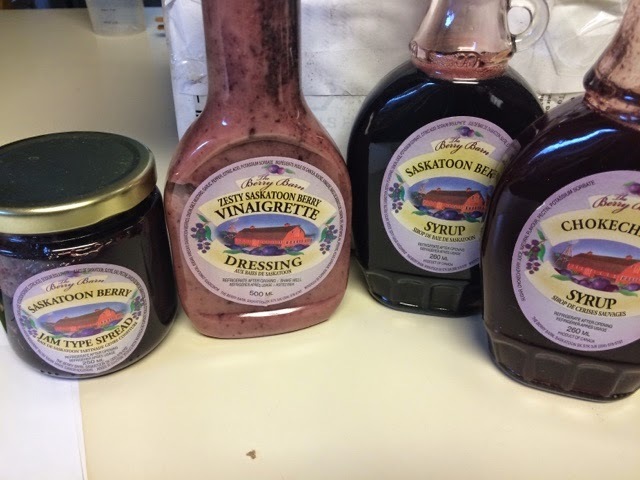 I’ll make pancakes and we will try the two syrups! I confess that I was a little confused how to find “something representative of my region” for a gift when we are fashion bloggers! I had figured that since we are Style Me Bloggers the gift would reflect that and be some sort of fashion item! So that’s why I was a bit surprised when I opened Deena’s gift and found food! I then thought of all the possibilities I could have done to represent Florida. But, alas, I had gone with fashion instead of food for my gift. Sure hope my recipient likes what I got and can use it. She’s from Canada too! It’s been so much fun getting to know (virtually) a group of ladies through the Style Me Challenges, and even more through blogging about it. I have wanted to blog more but something always seems to come up and I just don’t do it. Participating in the Style Me Bloggers link up has forced motivated me to blog more. A rousing thank you goes to Alison, the lady behind these fashion challenges. I am participating in my third challenge and am still learning and having fun! You *can* teach an old dog new tricks! Be sure to check out what the other bloggers received through their Elfter giver below! lol Love that pic of you!!! Mmmmmm saskatoon berries!! Edible gifts are the best!! They are soooo tasty! And you’re welcome! Yum…all that looks DELISH!! Enjoy!! Thanks! I most certainly will! That all looks delicious! Can’t wait to hear about how good it is! Yum – everything looks so good! Aw, how cool! I love that you got something regionally themed! It looks yummy. Thank YOU for participating in these challenges! You ladies have been an incredible blessing to me this year. All the best to you and yours in 2015! Alison, thanks again for the challenges! I’ve been having so much fun, learning so much (both fashion and blogging related) and “meeting” lots of new people! Looking forward to the menswear one! I was so worried you wouldn’t get it in time…yay! Glad you like it! Deena, seriously, thank you so much! I love it all! I love pancakes! For some reason, whenever I have surgery (not that it is a monthly thing), I wake up wanting pancakes. I bet that syrup is incredible. 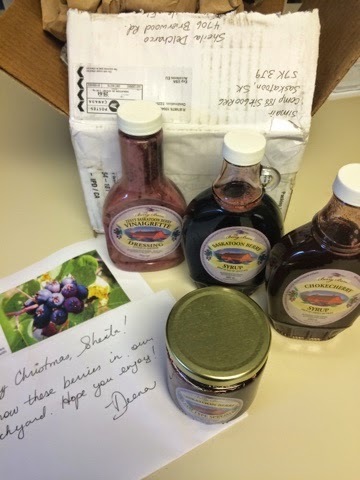 Thank you for sharing your great gifts from Deena.